In a digital step that would make hassle free entry possible for domestic visitors into Arunachal Pradesh, Chief Minister Pema Khandu this afternoon launched the e-Inner Line Permit (eILP) programme in a simple ceremony. 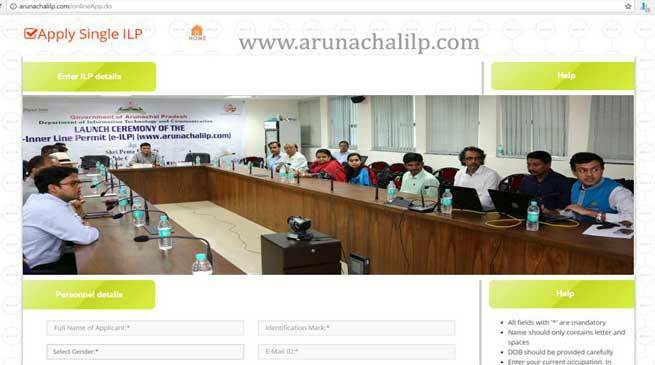 Khandu click-opened the web portal www.arunachalilp.com that provides visitors to apply and obtain the mandatory inner line permit (ILP) online from anywhere in the country. A system conceptualized by State Council for IT and e-Governance and developed by Bohniman Systems Pvt Ltd for the department of Information Technology is feature rich and user-friendly that allows online submission of required documents, photograph and payment by a visitor or group of visitors. The system is mobile responsive and hence the ILP now issued will be paperless. Congratulating the department for the ‘historic’ initiative, Khandu expressed optimism that with the hassle-free and paperless system there would be a significant increase in number of visitors to the state as they will now avail ILPs from their homes without having to go to the designated offices physically. He however emphasized on providing training to the personnel at designated offices of Resident Commissioners, Deputy Resident Commissioners and Deputy Commissioners so that they are familiar with the system and can issue ILPs without creating any confusions to the applicants. He also stressed that verification of documents submitted must be thorough and the system be error free so that it is not misused or manipulated. As the issued ILP will now have Bar and QR codes for verification, Khandu said the security personnel manning the entry gates will have to be properly trained and equipped so that entries with fake ILPs are checked and genuine ILP holders are not subjected to inconvenience. For this he requested the department to hold an exclusively training session for the police. The Chief Minister was informed that the present system is designed to cater only to domestic visitors but the department is working on offering a similar platform to foreign visitors also. Special Secretary IT, Prince Dhawan explained that after fulfilling all criteria online, visitors will receive the ILP with unique identity number and codes in soft copy in their emails, which can be displayed on their mobile handsets or tabs at the entry gates. However, exception has been kept open to avail ILPs at entry gates and other designated places (like Guwahati airport) physically on payment of certain fees. Soon the state government through a notification is all set to completely stop issuance of ILPs in hard copy through designated offices. In that case, ILP system, which is mandatory for Arunachal Pradesh under the Bengal Eastern Frontier Regulations, 1873, will be one of the first office procedure to go paperless. The launching ceremony was attended by the Commissioner Finance, Secretary IT, Director IT and other officials of the department and representatives of the developer company.